Well hello there! I apologize for the prolonged absence, but life and work have eaten up the majority of my time as of late. Still, even though there hasn’t been much activity on the blog, I have been hard at work on some projects and events that I thought I’d bring you up to speed on. If you live in the Manassas area, I will be giving a lecture and book signing next Thursday (February 27th) about New Market Heights at the Old Manassas Courthouse at 7 PM. The Old Manassas Courthouse was the site of the 1911 Peace Jubilee, so it is a great setting for a talk on the Civil War. I was also supremely honored to be invited to speak to the Union League of Philadelphia’s Civil War Round Table about New Market Heights on September 24th. As you may recall, the Union League houses the original Don Troiani painting Three Medals of Honor as well as many other priceless works, so I am eagerly anticipating being able to soak in the atmosphere of this legendary site! From Philly, I will turn my gaze south to Henrico County where I will participate in a whole host of commemorative activities put on by the County and Richmond National Battlefield in honor of the 150th anniversary of the fighting around Chaffin’s Farm. 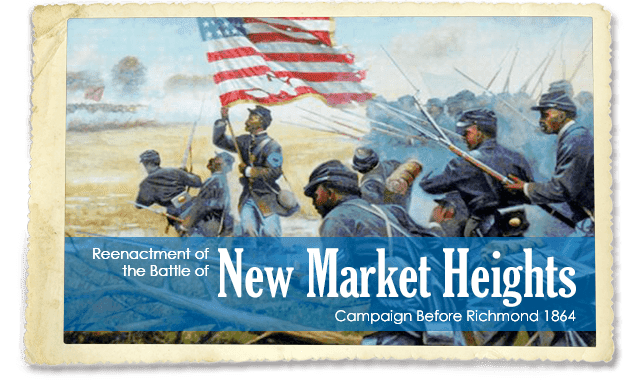 As you may have heard, from September 26 – 28 Henrico County will be hosting a re-enactment of New Market Heights and Second Deep Bottom called Campaign Before Richmond 1864. I’ll be bouncing back and forth between the re-enactment and the events taking place at Fort Harrison and then I’ll be giving real-time walking tours of the New Market Heights Battlefield on the actual anniversary. Needless to say, I will be in serious need of a vacation by October 1st! And speaking of Henrico County, I also wanted to let you all know that I will be helping the county’s Historic Preservation & Museum Services Division give what looks to be the only commemorative tour related to the Battle of Yellow Tavern, where legendary Confederate cavalier J.E.B. Stuart was mortally wounded. This will be an all-day bus tour on the actual anniversary (Sunday May 11, 2014) and will cover sites such as Beaverdam Station, Ground Squirrel Bridge, Walkerton Tavern, and the site of Stuart’s wounding among others. Check the county’s even website for updates on how you can be a part of this once-in-a-lifetime event! While this is certainly enough to keep any mortal busy, I am also putting the finishing touches on my second book, which will cover the First Battle of Deep Bottom. Fingers crossed, it should be out in time for the anniversary. I have tried to keep up with other Civil War news and chatter from around the blogosphere (as long as it doesn't relate to the Virginia Flaggers – I’m OVER it) but the above-mentioned concerns have kept me from devoting as much time as I’d like. I did notice that there was some hub-bub over Dr. Allen C. Guelzo being the co-winner of the Lincoln Prize, but since I don’t subscribe to the fallacious notion that Gettysburg was the most important end-all-be-all crucial high water mark in all of Western civilization…I don’t really care. Congrats to Dr. Guelzo! Is anything being planned to commemorate the fall of Richmond in 2015?